TotteMEAL is one of the business ideas of Game Changer Catapult. It is a new food solution to be offered using an IoT device that attaches to a refrigerator, and by working with outside partners for smartphone app creation and food delivery. The aim is to develop close relationships with busy business people by providing them with lunches that meet their needs. The core target customers for totteMEAL are those office workers who struggle to find something for lunch. In Japan, such people are sometimes termed, "lunch refugees". We as totteMEAL team granted that "lunch refugees" include people who occasionally find themselves unable to obtain food during their lunch break, or who can't get what they want for lunch. For the totteMEAL project, the following hypotheses were made concerning why people might find themselves as lunch refugees. In order to understand the situation based on these hypotheses, we interviewed busy office workers. What are the actual lunch habits of office workers? "What did you have for lunch?" Using this question, we sought to find out what office workers actually do for their midday meals. We found that people working in office towers have their own individual strategies concerning lunch. Based on actual lunch habits and analysis from a dietician, we identified the social issues that totteMEAL should try to solve. Mr. A was on a diet from February to June of this year. He reported that he tried to eat foods that can minimize weight gain, especially those low in carbohydrates. He seemed to be well informed about healthy eating by reading various sources of information. On Monday, because I had so little time, I went to the convenience store in the basement of my office building. Nothing really appealed to me, so I decided to choose something healthy. I bought a bento with balanced nutrition and a good quantity of food. I also decided how to eat it. I ate the salad before the carbohydrates because it is supposedly more difficult to gain weight that way. On Tuesday, I bought a bento on my way back from an appointment. As knew I had a meeting soon after returning to the office, I bought the bento and ate it quickly. On Wednesday I did not have as much time as on Monday, so I purchased a salty chicken salad and a sandwich at the same convenience store. I always try to eat vegetables. It was my first time to try that salad. It was more filling than I thought it would be, and the meat was delicious and satisfying. I like meat, so while still being health and calorie conscious, I want to eat meat if possible (laughter). However, since the salad was a bit expensive, just under 700 yen, I can't buy it often. On Thursday, I purchased a health-conscious bento. It was mainly salad, with a choice of three items. It was tasty, but cost almost 1,000 yen. I wish it was around 700 yen. On Friday, I ate out with a colleague. We went to a local Thai restaurant and I had a set lunch that cost 1,100 yen. There was also one for 900 yen, but I decided to splurge (laughter). Eating out with someone, and enjoying good conversation can really be revitalizing. Furthermore, in my office there is a break table where nuts and 95% cacao dark chocolate are always available. I actually crave sweet things, but I'm on a diet. I no longer eat the cakes and fruits I used to love. Basically, I spend half my time in the office and the other half out in the field. It is hard for me to control my schedule because I usually work on teams. I have lunch in my spare time. My office is on the 21st floor, and the elevator is busiest at noon. When I need to go out at that time, it takes a while for the elevator to come and sometimes it is full. So the elevator takes me about 10 minutes for both directions combined. Ideally I would like to eat out with someone, but in reality I'm busy and I don't have the time, so I just eat quickly alone. I usually purchase something at a convenience store or bento shop, and eat while reading work materials at my desk. Therefore, when I eat with someone else, I don't restrict my carbohydrates and I don't care about the cost either. Also, if I had a little more time, I'd like to take a 15-minute nap (laughter). If you eat processed snack food, you are only consuming carbohydrates and your blood sugar level will rise. Then as it drops, you feel drowsy and your work performance will suffer. Therefore, nuts are a better snack. They are low in carbohydrates and contain minerals. They provide magnesium, zinc, and calcium, which people tend to lack. Personally, I recommend kombu (kelp). It is rich in dietary fiber, such as minerals and alginic acid without many carbohydrates. I think cheese is good too, since it has almost no carbohydrates. Mr. B was on the swim team in his school days and still continues to swim after work. Rather than worrying about variety, he has a serious approach to workday lunches centering on work performance and staying fit. What did Mr. B have for lunch? I have the same lunch every day, and I buy it at a convenience store on the way to work. I get a 100-yen package of shredded cabbage and an onigiri. I also get a piece of chicken or a sausage from the hot food counter. Eating too many carbohydrates makes you sleepy and it affects your work in the afternoon. That's why I thought my lunch should be plain and simple, and I decided on this combination. I didn't really research it, but I felt it would work (laughter). I tried it and liked it, so I stayed with it. Considering that I am mainly doing desk work, I think the calories are adequate. By the way, when I was a student I used to eat something different every day in the cafeteria. After I joined the company, I ate out for about a month. However, there are only two elevators in the building and it gets crowded from noon to one. It takes 10 minutes to get down from the 9th floor, and another 10 minutes to go back up. Considering it takes another 20 minutes to get to the eating place and back, that leaves only 20 minutes to eat. In addition, there are not many cheap places nearby. Paying over 1,000 yen per meal caused me to give up on eating out. Interview with Mr. B (foreground). 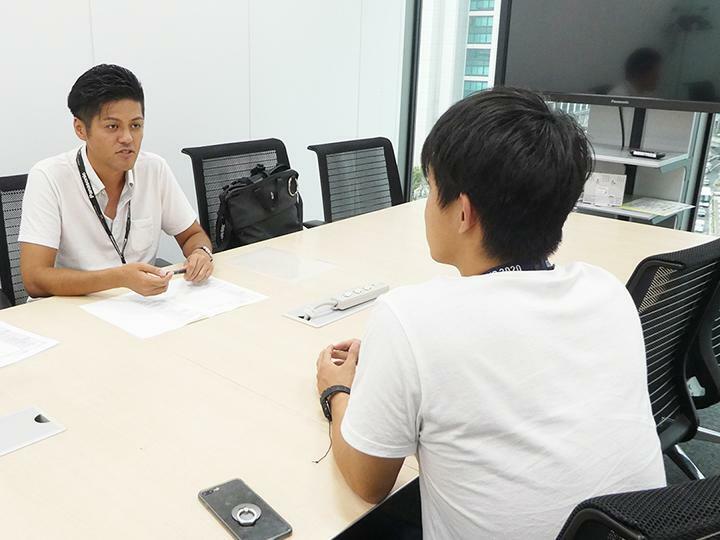 The interviewer is Yoshiyuki Inoue, the project leader for totteMEAL. However, the main reason for my light lunch is that if you eat too much, you will get sleepy. At lunch time, there are bento vendors who come into the building, but they sell lunch boxes full of fried foods. They are popular because they only cost 500 yen, but since they are heavy on the rice, I don't feel like buying one. To tell you the truth, I am not that interested in food in the first place (laughter). For me, eating is about nutritional intake rather than pleasure. Nonetheless, I don't eat quietly alone. I enjoy having my lunch while talking with colleagues in the shared space on our floor. So, I'm satisfied with my current lunch. Even if it is the same five years from now, I'm totally fine with that. I have always liked physical training, and I want to continue swimming, which I have been doing since I was a student. I don't want to lose the fitness that I have worked so hard to achieve, so I am careful to maintain my physical strength and body shape. So, if healthy lunches were sold at a reasonable price in the building, I would probably buy them. If plain steamed chicken breast in bite size pieces were available, even if it were somewhat expensive, I would be so happy. I'd have it as a snack at three o'clock, while working at my desk. It is great that he is motivated to actively seek nutrition. On the whole, I think the nutritional balance of his lunch is better than eating ramen and rice, for example. However, the shredded cabbage found in convenience stores has little nutrition. Overall, it is short of calories. Also, convenience store food usually has too many additives. Processed foods, especially chicken and sausages, generally contain too many phosphates. I don't really recommend convenience store meals, as it is difficult to get nutritional balance, there are too many additives, and people tend to choose the same thing each time. Mr. C is busy every day, spending 70% of his time outside the office, so he has no time to eat lunch slowly. Even if he goes out for lunch, he does not have time to eat in a restaurant. He usually gets takeout, and prefers something he can eat with one hand while working. If it is also delicious and healthy, that makes him even happier. What did Mr. C have for lunch? Monday, because I did not have time, I used the snacks available for purchase in the office. Because I only had a 500 yen coin, I chose two packets of snacks that could satiate my hunger, and with the remaining money I got a cookie-style nutritional bar, and some chocolate. I ate them while working. On Tuesday, I had a little extra time, so I went out to buy a bento lunch. It cost around 700 yen and came with miso soup. On Wednesday, I went to the supermarket in the basement of my office building before going out to an appointment, and bought two sandwiches and carbonated water. I ate in the taxi on the way. It was the same on Thursday. On Friday, I went out to a meeting and on my way back I dropped by a ramen shop that is well known in the area. I do not eat much between meals. Sometimes I use the snacks available for purchase in the office, but basically I don't eat snacks. I used to eat a lot of deep-fried rice crackers before, but I stopped because I was becoming fat. Usually I don't eat out. Instead, I purchase my lunch and bring it back to my desk, or I eat in a taxi. So, the most important thing is to be able to eat with one hand while working. Still, I try to choose something that is delicious and healthy. I purchase about 60% of my lunches in convenience stores and 40% in bento shops. I buy them whenever I get time to do so. At convenience stores I buy sandwiches and rice balls. I think I should also get some vegetables, but a salad cannot be eaten with just one hand (laughter). Although I sometimes add something like coleslaw, I often buy a smoothie instead. Those lunches cost about 600 to 650 yen. In the bento shop, I choose a lunch box that costs about 700 to 1,000 yen. Whether in a convenience store or a bento shop, I usually end up choosing the same thing, in order to save time. When I think about it, my diet is not that healthy. I also love to drink alcohol (laughter). Strictly speaking, the only healthy thing I do is to buy and consume a nutritional jelly drink during my morning commute. I believe it is good for me, but I don't eat anything else for breakfast. I played basketball from junior high school until university, but now I don't get enough exercise at all. Although I used to go to the gym, lately I haven't been able to go. However, I do get some exercise playing in the park with my three-year-old kid. Although I'm busy every day, I do want to eat out if I can find the time. Usually I choose something easy like sandwiches, which do not have to be warmed up, but occasionally I feel like a proper meal. I want something fresh, hot and healthy that has been carefully prepared (laughter). Since lunches are usually reasonable, I'm not too concerned about the price. However, I think 1,500 yen is a bit high, so around 1,000 yen is good. I enjoy it when I can have a leisurely lunch and then read a book in a café afterwards. Nevertheless, I find my current work rewarding, so I'd like to be able to get delicious and healthy meals easily within a limited lunch break. Even with takeout bentos, it would be ideal if I could get something with enough vegetables for the entire day. I would like to get good nutrition through delicious meals, not from a boring nutritional bar. Also, it would be nice to be able to get a variety of individual side dishes and meat portions more easily. We want to create great lunch experiences for working people! What can totteMEAL do? Based on the three people who participated in this interview survey, it seems the lunch situation is different for everyone. Each has his own work environment, lunch strategy, and preferences. However, it is clear that each person makes lunch choices for individual reasons. For office workers, lunch decisions will inevitably be restricted by the office environment and time. The difficulty lies in finding ways to accommodate and work around these restrictions concerning lunch. Meanwhile, in the online survey, 11.1% indicated a lack of lunch options as source of dissatisfaction. In the interviews however, many responded that choosing is troublesome. While people hate having no choice, having too many choices could be a burden during a limited lunch break. This leads to the hypothesis that people are not looking for a wealth of lunch choices, but just enough choices so that they can meet their own needs, and get true satisfaction. In that respect, it might be a good idea to offer lunch options for different purposes, such as "aggressive charge meals" or "recovery meals." TotteMEAL could also help provide such options. We came up with the idea of making it easy for people to purchase meals that suit them, using a smartphone app. One day soon we could even realize a service where bentos instead of just snacks are available for purchase in each office. In this way, based on the in-depth comments received this time, we will continue to expand the possibilities for totteMEAL. To maintain and improve the health of workers using food, AIVICK has developed a convenient bento service for companies called TAVENAL. AIVICK is developing business areas to support the health of society through food and information and communication technologies (ICT). It has been collaborating with Game Changer Catapult since totteMEAL was first exhibited at South by Southwest 2017. 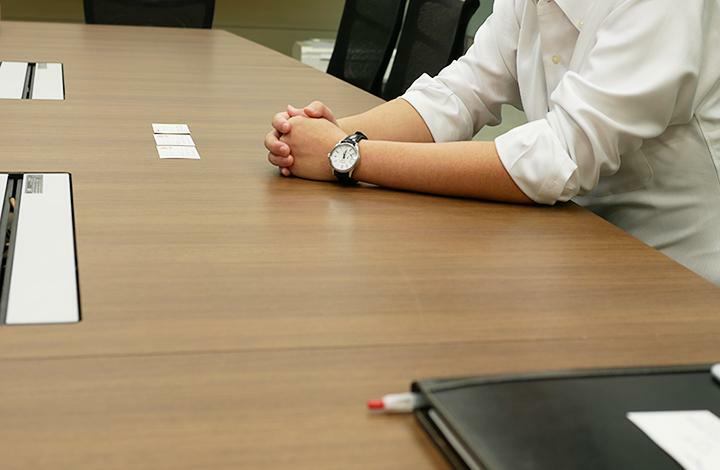 The company agreed to participate in our recent interview survey, and a dietician from AIVICK assisted us with comments and investigation concerning the lunch habits of office workers. What will we see if offices will be visualized? Examining the lunch situation of people working in Tokyo: Why are there "lunch refugees"?